Hello my friends! Right now I am in Uganda about to begin my eight day tour. I will be doing my part for Kony 2012 by searching for the infamous leader, so things will be a little quiet around here for a week or so. Haha…I kid I kid! However, I do promise to return with lots of stories and photos. For Flashback Friday I wanted to transport you to paradise. 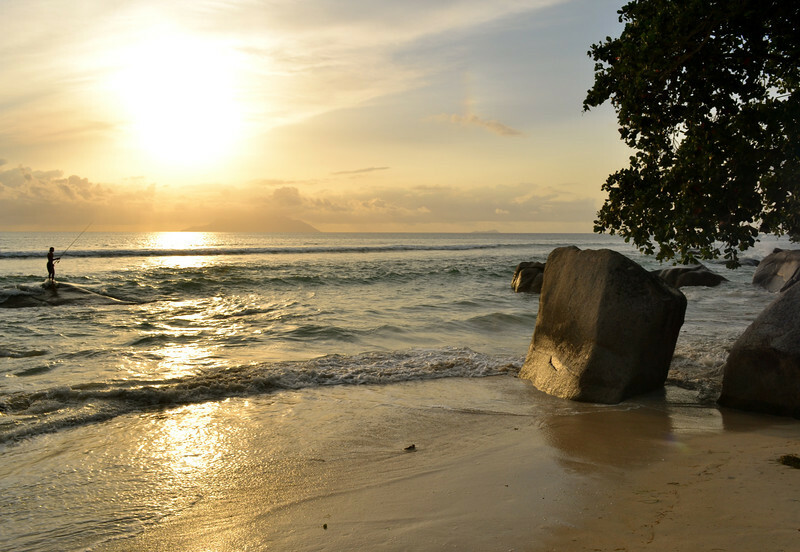 The Seychelles are famous for their pristine beaches and high-end resorts. On this balmy evening, I found myself walking along the beach. My toes sinking into the cool wet sand; children running in the waves and laughing; lovers caressing on a nearby blanket. It was one of those perfect evenings where everything in the world seemed right. I loved this photo because of the fisherman in the distance and the way the sun glows on the waves and sand. I hope you enjoy it as much as I do. Have a wonderful weekend!